GREAT FRIENDS, THOSE TWO “It’s alright. My dog does the same thing,” the old man said, smiling hospitably as his dog approached the other dog. The woman who owned the other dog smiled graciously as the two dogs cautiously inspected each other. 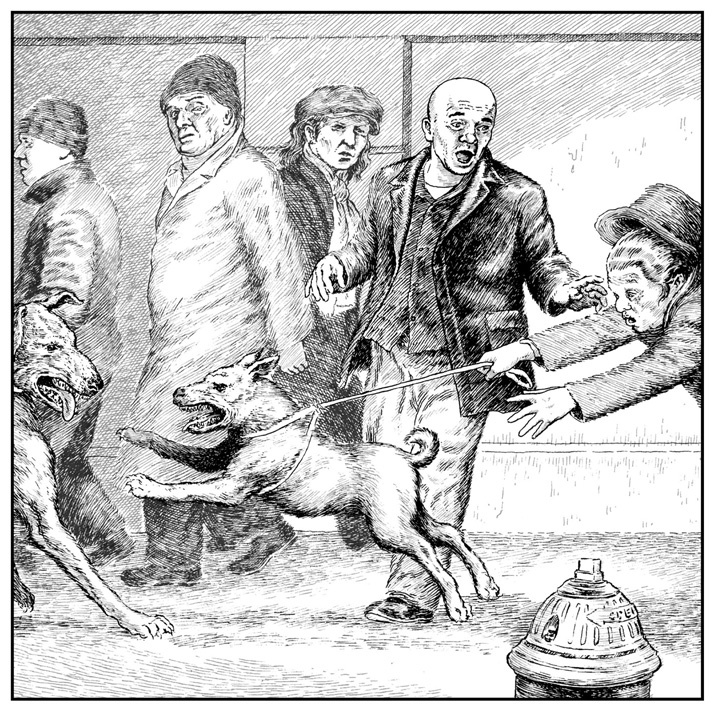 The woman’s dog was smaller than the other, and he remained crouched down on his belly, pricking his ears up. “My dog does the same thing. He’s being submissive. It means he wants to be friends when he lays down like that.” The woman nodded approvingly, but there was tension in her expression, hidden behind her timid smile. She watched as the big dog canvassed her small dog. The small dog lay low to the ground, anxiously situating his hind legs. Now, the big dog’s ears pricked up. “It’s alright,” the old man repeated reassuringly, “They’ll be great friends,” and, just as the man finished saying “friends”, the little dog burst forward, spit out a succession of rapid, snapping barks and struggled to bust loose from his leash. The woman gasped, lost her footing and toppled forward while another man grabbed for the loose leash as the woman lost her grip and hit the pavement. It seemed like a natural and common behavior: To attack that which gets too close. The awkward introductory process of friendship was off to a sporting start.